More than 20 years ago, a billboard in China piqued the interest of a chemical biologist. It endorsed an extract from the plant known as the "thunder god vine" as an immunosuppressant. A brief review of published research revealed that the extract's key ingredient—the small molecule triptolide—had been identified 20 years before that billboard ad, and it could stop cells from multiplying. Now, that chemical biologist and his colleagues at the Johns Hopkins University School of Medicine report that tests of triptolide in human cells and mice are vastly improved by the chemical attachment of glucose to the triptolide molecule. The chemical add-on makes the molecule more soluble and essentially turns it into a "cruise missile" that preferentially seeks out cancer cells, the research says. The change might also decrease side effects in patients and make the drug easier to administer. "We have a long way to go before we can test this derivative of triptolide in humans, and we think that additional adjustments could improve it even more," says Jun O. Liu, Ph.D., professor of pharmacology and molecular sciences at the Johns Hopkins University School of Medicine and a member of the Johns Hopkins Kimmel Cancer Center, "but it already has the key characteristics we've been looking for: It is quite water soluble, and it prefers cancer cells over healthy cells." Because triptolide halts cell growth, it works well to fight the multiplication of cancer cells, Liu says, both in lab-grown cells and in laboratory animals with cancer. Unfortunately, it—and many of its derivatives—has failed to work well in patients because it doesn't dissolve well in water or blood, and has too many side effects due to its indiscriminate killing of healthy cells as well as tumor cells. Liu's latest research sought to "train" triptolide to target cancer cells by exploiting the knowledge that most cancer cells make extra copies of proteins, called glucose transporters. Those transporters form tunnels through a cell's membrane to import enough glucose to fuel rapid growth. By attaching glucose to triptolide, the researchers hoped to trick the cancer cells into importing the cell-killing poison, as had been done successfully with other anticancer drugs. "We were looking for something that could be administered intravenously, remain stable in the blood and then become active as soon as it was imported into cancer cells," says Liu. To begin, the chemists designed and synthesized five derivatives of triptolide, dubbed glutriptolides. 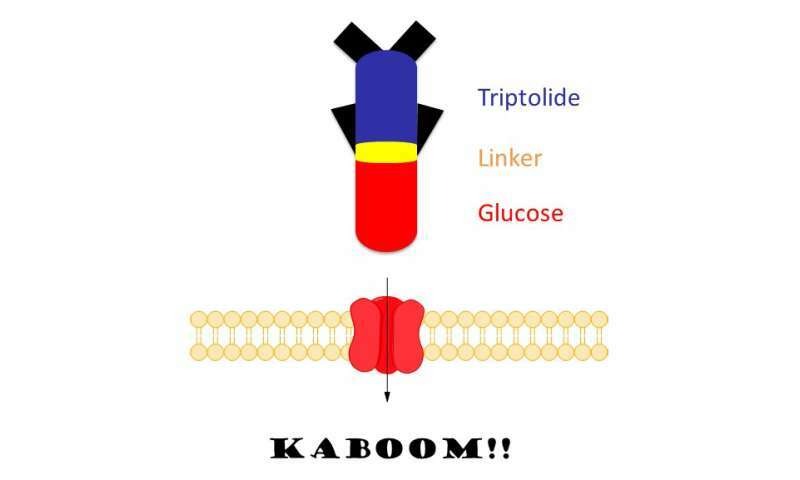 Each derivative had glucose attached to the same spot on the triptolide molecule but had different "linkers" connecting them. In later test tube and cell experiments, the researchers confirmed that glutriptolide 2 works just like triptolide—by interfering with XPB—though it does so only in higher concentrations. They also showed that a cancer cell line (DLD1-Mut) known to produce lots of glucose transporter 1 was more sensitive to glutriptolide 2's effects than a similar cell line (DLD1-WT) without extra copies of the transporter. When the researchers assessed triptolide's effects on a variety of healthy cells and cancer cells in parallel with glutriptolide 2, they found that triptolide tended to equally slow the growth of healthy cells and cancer cells, while glutriptolide 2 was eight times more effective against cancer cells, on average. Liu says this result suggests that the new compound—if tested in humans—may be more selective against cancer cells and could therefore have fewer side effects. Finally, due to the differences in the compounds' general toxicity, tests showed that mice could tolerate a dose of 0.2 milligram/kilogram of triptolide and 1 milligram/kilogram of glutriptolide 2. At those doses, glutriptolide 2 eradicated tumors more quickly in mice with prostate cancer and prevented tumor cells from reappearing for a full three weeks after treatment had stopped. "We were totally surprised to see that sustained antitumor activity," says Liu. "It's something we want to study further." The group plans to test additional modifications to the biochemical links that connect glucose to triptolide to see if it can further decrease the compound's toxicity to healthy cells and increase its effectiveness against cancerous ones.